When you say business website, you say professionalism. Business and corporate presentations have distinct features. And with such features, they can make or break a company’s progress and flow of clients. Professional design (it is translatable into a clear design, with structured information and enough negative space to focus attention on the info). Also, it means coherence of the different design elements (colors, buttons, links, sections) and a unified look of the presentation. Mission, vision and values are central to a business website. They must be clear and really make a difference. This is the core reason why a business exists. And it should be pivotal to the design style for a company’s website. Branding has to fit onto the business specifics. It concerns logo, colors, layout, tone of voice for communication, the message as it has to be perceived by users, all has to transmit values that are inherent to the business personality. A slider can give a major advantage to a business website: all the important content can be placed into an interactive and visually appealing slideshow in the upper part of the homepage, before main content is presented. Color schemes need to have multiple options, so they can be easily adapted to the brand personality. They are a major element in determining the professionalism of the website design. Services – the website should have a dedicated section/page for services that company provides. As important as who the business represents, what the business does for people should be presented in an elegant and convincing manner to users. 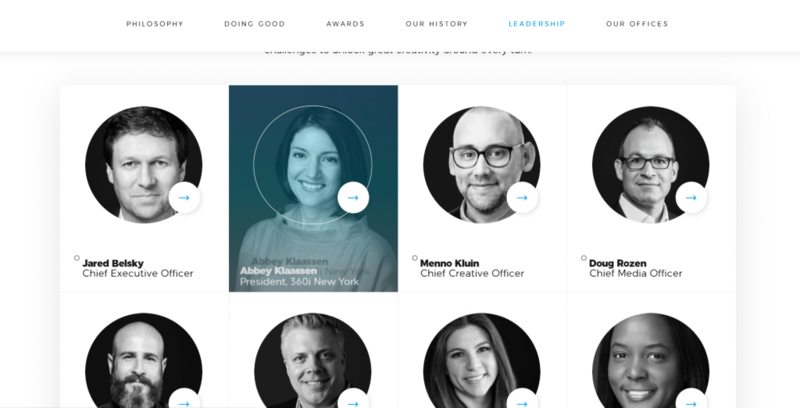 Team and employees (+ employees bio) presentations (in a section or in a whole page) can be a great asset for a business website. They ensure transparency and connect the business to website users through a human element. 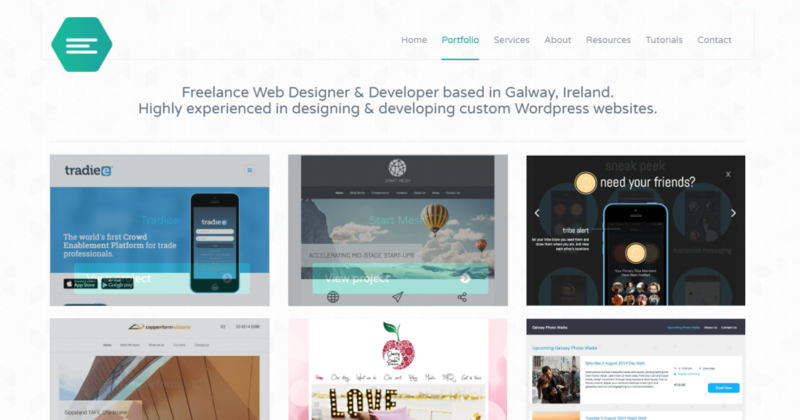 A portfolio section is another element of trust in a business website. It comprises a list of the company’s projects and showcases the best work, recommending the business to new clients and partners. Testimonials are the best proof of quality services, as they are recognized as such by past and current clients. So, a business website should include a testimonials section, as well. A contact form for clients to quickly get in touch with the company is key in a business website design. It would generate inbound leads, for emailing campaigns, brochure downloads, video views, sales, etc. A blog section is more than welcome for a business website. Together with the team and employees’ section, it sets a friendly tone of voice for communication with website visitors. Case studies can be the subject of an individual section in a business website. They are extended presentations of past and current projects and prove with facts and figures the success of the company on the market. Highlight comes with plenty of demos that help business owners start on a good basis. They are specially created for a diversity of niches, facilitating a designer’s work. Plenty of options for the Hero, navigation, page content and footer, for customizations to the minutest detail. Many section blocks for a good selection of the most appropriate ones to create the website you want, exactly the way you want it to look. A focus on Hero customization, as Hero is an important element that captures users’ attention as soon as they land on the website. It has the option to attach a blog to the website, and constantly add fresh content that keeps the website updated. Features for the site identity will help give form to the brand personality corresponding to your business. 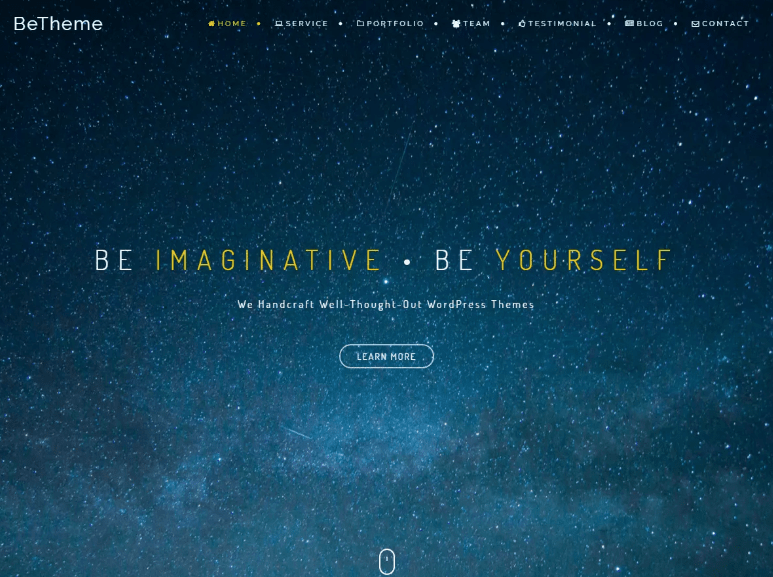 Mesmerize is a multi-purpose theme that can be a good fit for any business niche. It has just so many options as needed to create a perfect website. Your website. It focuses on visual elements that give a pleasant aspect to the website. The Hero, for instance, can be customized using: an image, a slideshow, a video, an effective color or a suggestive gradient. First impressions count, so the Hero can be customized separately, both for the homepage and the inner pages (thus, each page has its own chance to impress). The theme is fully integrated with the Autoptimize plugin, so upon installation of it, your website speed will be improved. The colors can be adjusted to best represent the website and the professional identity of the business. Astra is one of the top business themes out there. It is suitable both for presentation websites and online stores (as Astra is fully compatible with WooCommerce). Due to its compatibility with SEO plugins, integration with Schema.org and Native AMP readiness, the websites built with Astra have all chances to be well indexed and ranked in Google. Thus, they will gain visibility and more users, hence, more potential clients. The theme is oriented towards generating leads. Thus, it has customization options for Call-to-Action buttons, both in the content sections of the website pages, and in Header. These buttons can be emphasized with particular colors for the text, background and forms for those buttons (button radius, buttons padding). The layout can be customized independently for the header, blog, sidebar and footer. Thus, each type of content has its own arrangement, that brings to front content that’s important to your readers. 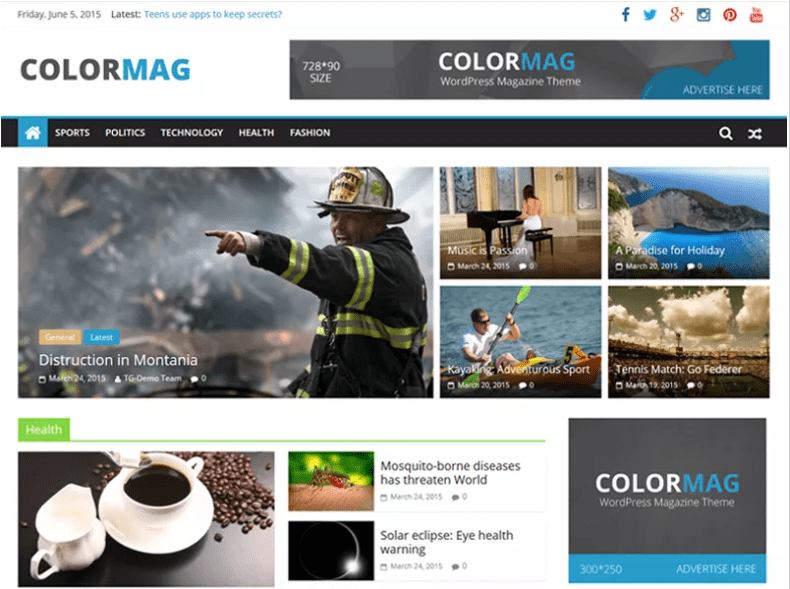 Colormag is a fully responsive theme, designed with mobile users in mind. Sites built with Colormag are adapted to mobile devices, and the information they contain can be checked any time, on mobile and tablet. 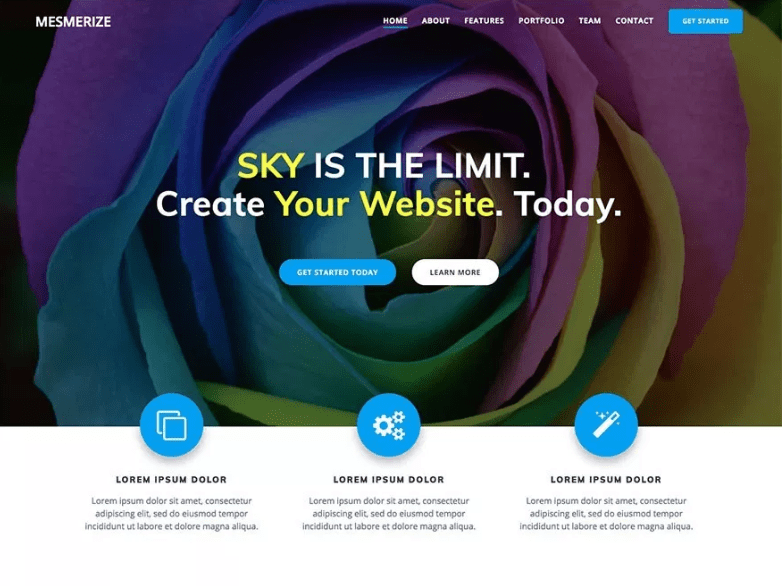 The theme has plenty of features that can take your website to the next level. Each settings category has many subjacent options, which can give you the possibility to make customizations to the smallest details. Site identity options concern both Header logo and Header text, as well as site icons (aka favicons that help users recognize your website by a representative image). The Header can receive additional customizations, such as media upload (video or image) – you can choose any video or image that is suggestive for your business. 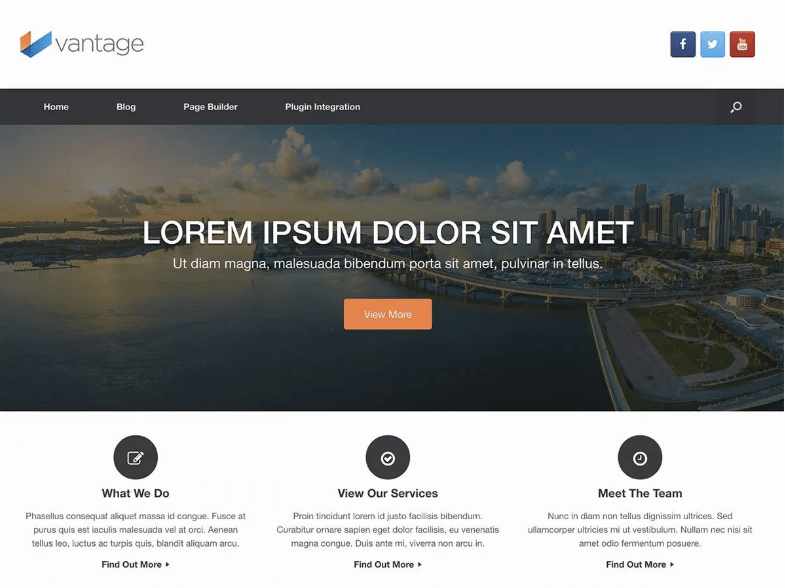 Vantage is a flexible theme, adaptable to any type of business. Moreover, it comes fully integrated with WooCommerce, for direct online selling of goods in e-shops. Also, the theme is fully responsive, so websites built with Vantage display appropriately on mobile devices. Not at all neglected, the footer is an important part of a website design. Vantage offers all needed options to customize it and integrate it well into the overall design. It provides the options to show widgets in 4 different areas: sidebar, footer, header or masthead. 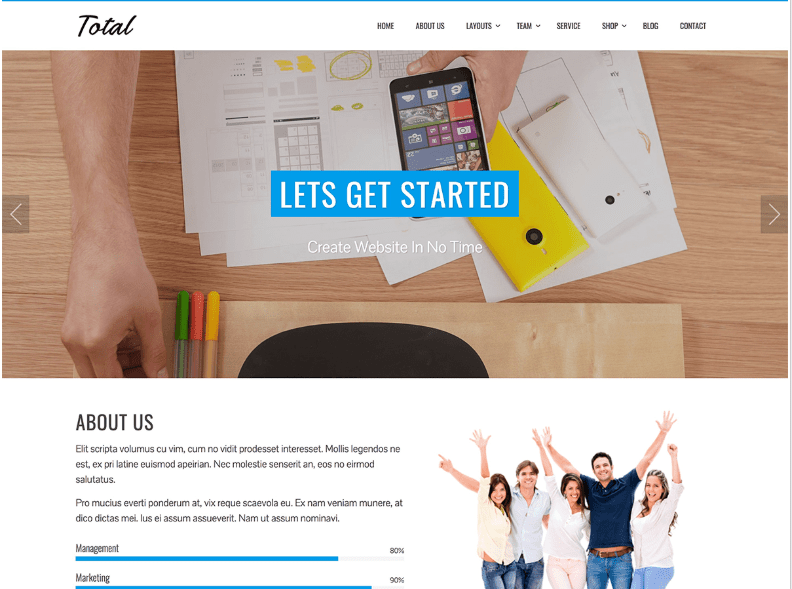 Total is a theme that has all the needed sections we’ve already listed as important for a business website. It has options for an elegant design of all these sections. Moreover, it is SEO friendly, so a website build with Total will have all chances to be well ranked in Google. It is compatible with WooCommerce, so online stores can consider Total for building their websites. The general settings include all you need to give shape to the site identity: customizations of logo, title, and subtitle, background image in accordance with the design guidelines, colors that transmit the emotions you want to associate the message with. The Home sections in Customizer are all it takes to take your website from draft to excellent website visitors will keep coming to. You have separate sections for: About us, Clients logos (to place in a gallery), Featured section (you can use it to present your unique value proposition in a creative way), Portfolio, Services (sustained by titles, subtitles and icons that effectively bring services to the forefront), Team section (with links to social profiles of team members), Counter section (prove your business strengths with facts and figures), Testimonials (facts and figures are backed by clients’ proof your services are the best), Blog section and Call-to-Action (key to generating more leads). 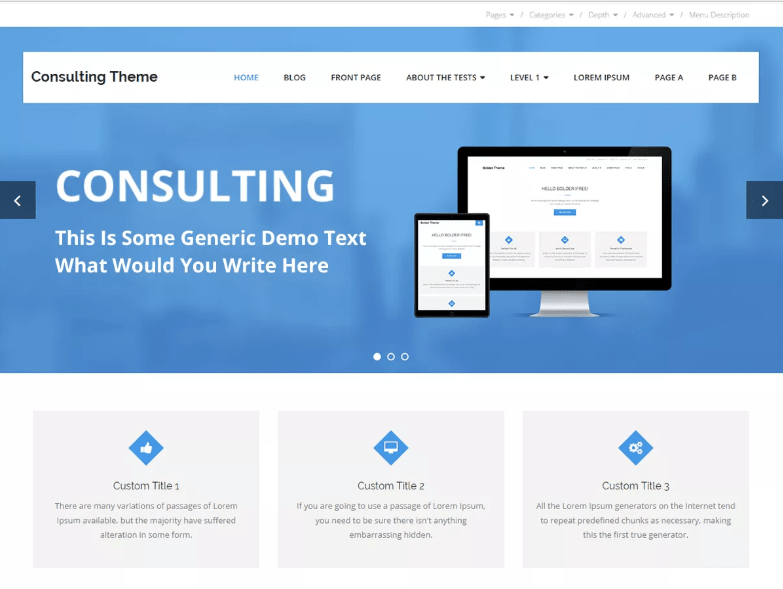 Consulting is a professional theme, designed for professionals. It’s perfect for building a business website, without touching any line of code. Just with the options in the Customizer. General theme options put a stress on pages structure. There are 3 different layouts you can choose from, depending on how you want the message to be articulated. An intro for the page will make a major difference in capturing users’ attention and driving them to further content in the page. The intros can be customized according to 2 styles, and it can receive a background color of your choice. Consulting takes into account what make a homepage strength: a slider (with images), and insertion of Calls-to-Action in the intro section. With some little customizations, you can turn a good page into an excellent homepage. The Header and Footer have plenty of customization options that are worth exploring and trying in a website draft. They might give your website design coherence, elegance and efficiency, all that means requirements for an outstanding business website. 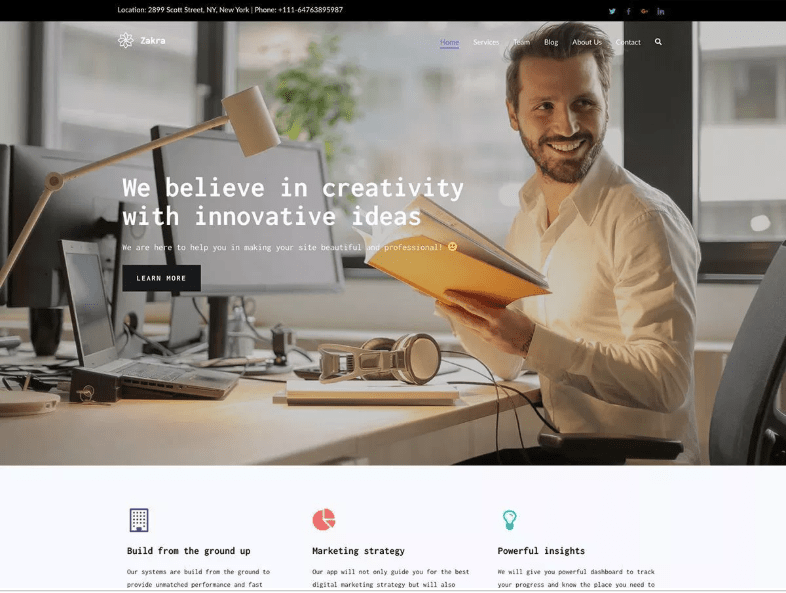 Neve is a simple to use theme for small business websites. It meets these important criteria: SEO-friendliness, for guaranteed visibility in search engine results pages, and mobile-readiness, for appropriate display on mobile devices. Customizable layout: it goes without saying, a business website with a good layout has a major advantage over its competitors. Neve offers options to adjust layouts for: Content/Sidebar, Blog/Archive, a single post page, containers, and footer. Colors are very important for transmitting professionalism, according to the branding guidelines for the business. They can be customized according to about 7 options and contribute to shaping the correct brand identity. Besides colors, typography is important in ensuring the correct presentation of your message. Neve has options for customizing all types of headings (h1…h6), as well as font family and fond size for the text content in the website pages. Ultra deserves its name. It’s designed especially to keep users’ engagement with a website build with Ultra. It provided a full-width Smart Slider, and a sticky menu, as well. The theme settings gather a bundle of options for each individual page section you’ll want to include in your website. They concern the Header, Homepage display, Navigation (with many, many options facilitating users’ orientation into the website), Footer, etc. 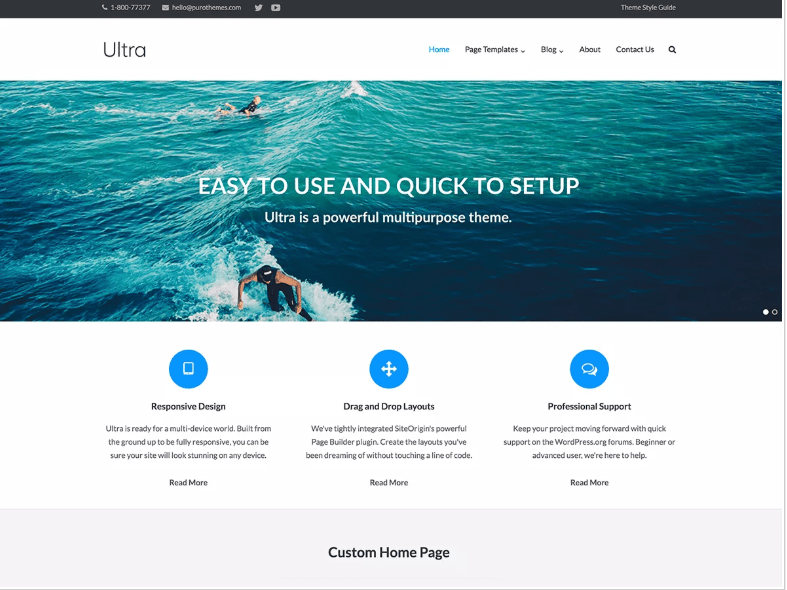 Ultra provides additional settings for page templates, that refer to blog pages, the search results page, the error pages, the author archives page, and not only those. Site identity settings couldn’t have missed: with the classic customizations, you can give the business website the identity you want. 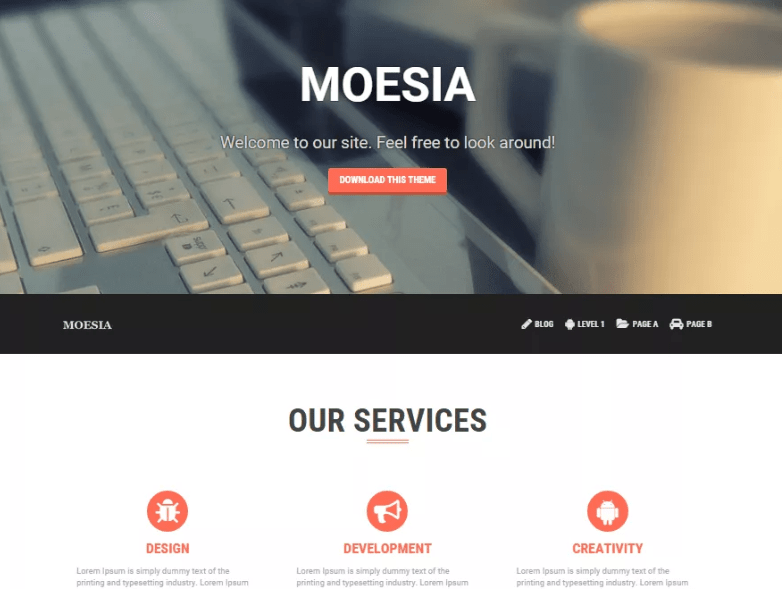 Moesia is a good choice for business websites. It comes with 11 predefined blocks that you can arrange and customize to your wishes, and according to your design guidelines. Parallax effects are applicable to any of the predefined blocks you choose for the website pages. Moesia comes with the possibility of inserting a welcome area. And obviously, of customizing it: a logo, a welcome message and a call-to-action are the only elements that can work their magic and increase people’s engagement with the website. The Header can be customized accordingly, with an image of your choice, representative of the business and of impact to your readers. Colors and front-page colors are essential to the brand identity you want to give to your business website. Moesia provides all needed options for the design to be in line with the branding guidelines. 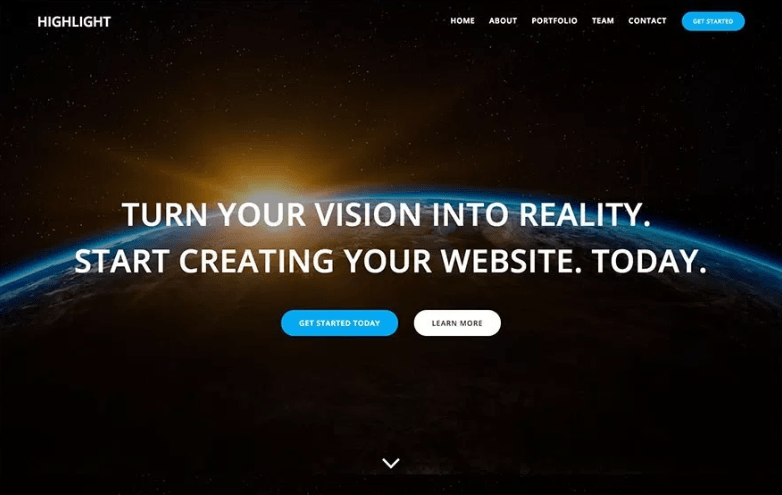 Screenr challenges web designers to create astounding business websites. It is a perfect choice for building business websites, both one-page or multiple pages websites. The full power of Screenr resides in its wide variety of Front-page sections that can be customized. These include the classic sections of a business website page (About, Features, Services, Clients, Counter, Testimonials, Contact, Pricing, Call-to-Action), as well as some additional sections that can make your website outshine the others in the area: video lightbox, gallery, latest news… they might not only signal your presence in the area where your business is active, but also indicate that your business website is unmissable. People will lose a lot by ignoring it, and your website design has the power to induce that Fear of Missing Out for not returning to the website, anytime the occasion arises. The theme options include features for site layout, styling and color choice, header, navigation, footer. By using these features, you can create a coherence of design from the very homepage of the website to all inner pages, from the Header of the homepage and down to the latest info presented on the page. 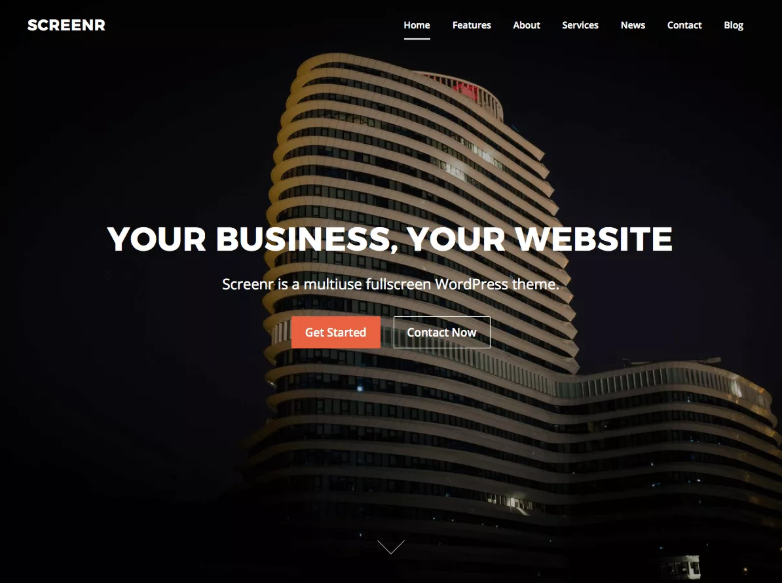 Zakra is a good choice for building a business website. It is compatible with all major WordPress plugins, so its functionalities can be extended with the needed plugins whenever it’s needed. 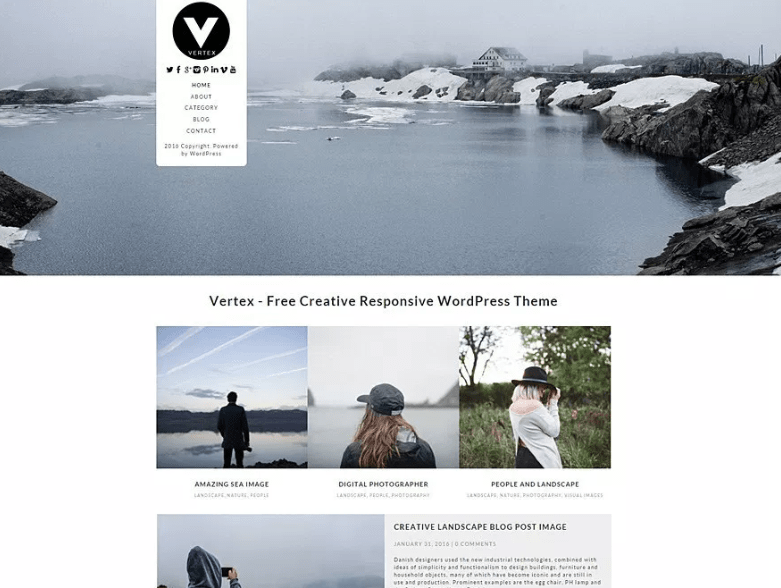 The theme is responsive and Gutenberg compatible. It all starts with giving an identity to the site. Logo, site title and tagline can be easily customized from the very beginning, according to the branding guidelines and the personality you want to give to the brand. Colors can give a major advantage in designing the perfect site identity, and they help transmitting the intended emotions into the readers. Zakra has different options for the header text color and the background color. The header can be further customized to capture readers’ attention and stir their interest into discovering more information on the website. Thus, you can insert an image of your choice into the header or upload a suggestive video that’ll make all the difference. 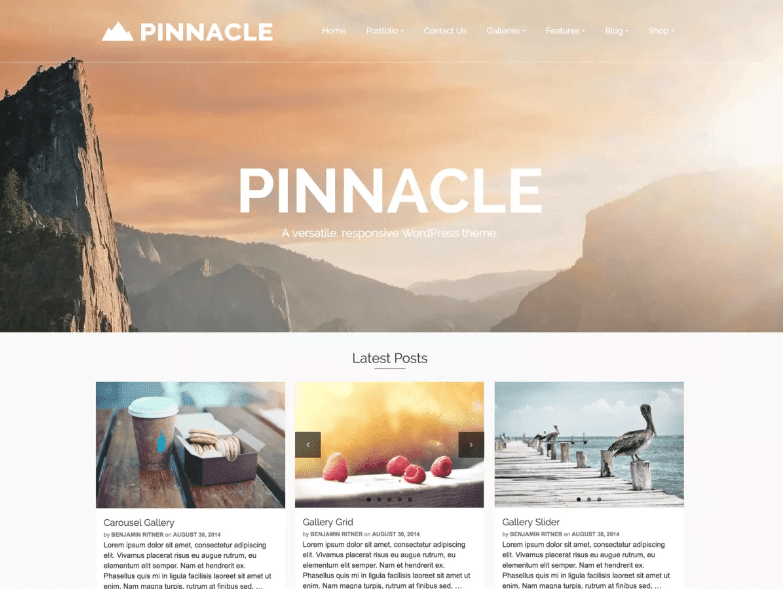 Pinnacle has a whole lot of features that give superpowers to those who build their business websites. It is fully responsive and displays appropriately on mobile devices. It can be adapted to any kind of business niche. 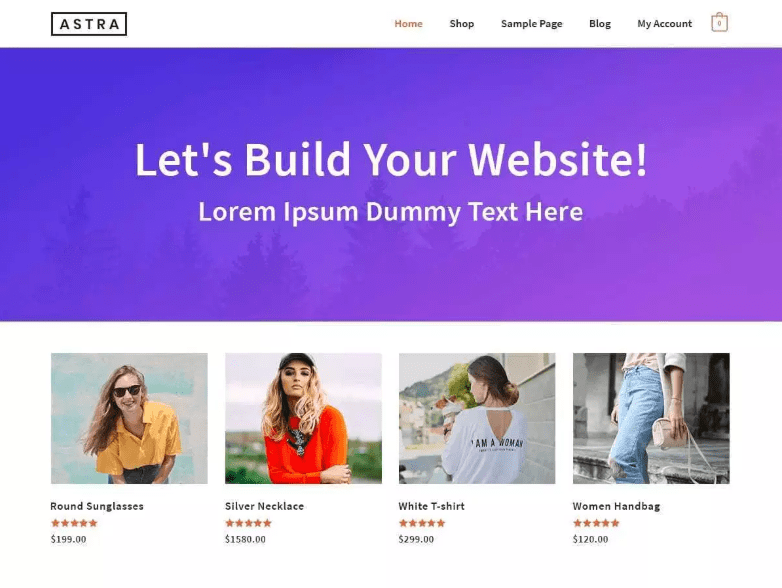 Next, you can proceed to customizations for the following: logo options, top bar settings, home layout and home slider, page options, product settings (in the case of online stores), portfolio options, blog options and footer layout. Some features need to only be activated, and the corresponding customizations will be applied to the page you are modifying. Vertex helps creating modern websites, suitable for presenting a business in the online space. The theme is responsive, and websites build with it are well displayed on mobile devices (tablet and mobile). Vertex comes with the option to add a featured text to the website. This space can be well used for presenting the unique value proposition specific to the business you want the website for. The theme has options to integrate links to the business social media profiles (Twitter, Facebook, Instagram, Pinterest, LinkedIn, Vimeo, YouTube). The basic site identity settings (for logo, title and tagline), the colors for the website color scheme, settings for the background image in the website pages, all are destined to customize the website, so it best represents your business. 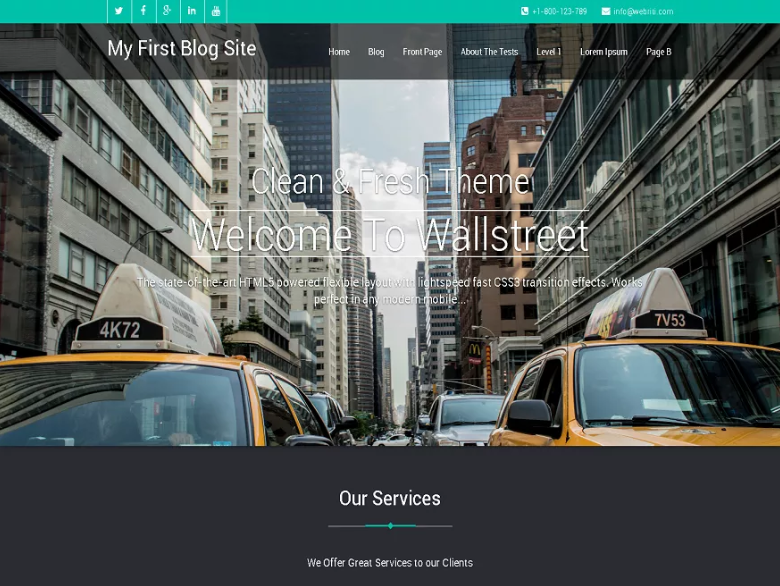 Wallstreet is a theme specially created for building business websites. It is suitable both for small businesses that want to have a professional look and for corporate presentations where every detail inspires trust, efficiency, a well-established status. 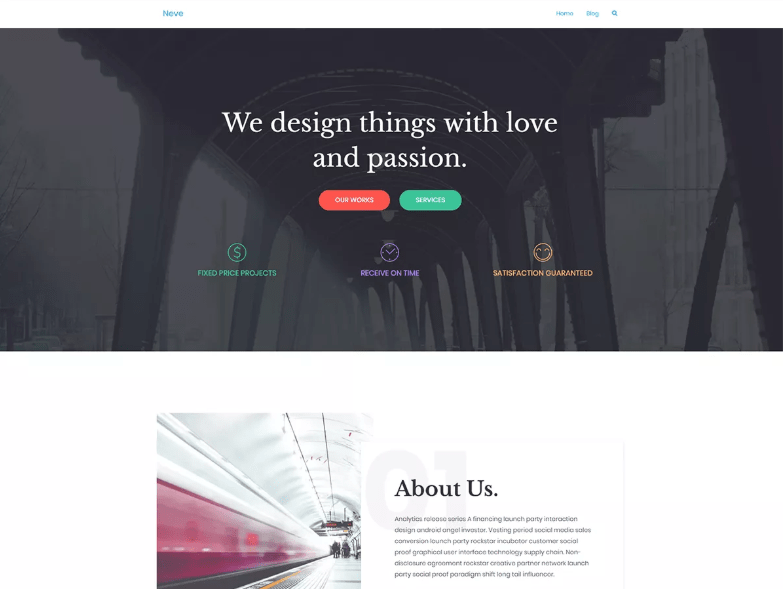 This theme has specific settings for 2 sections dedicated to business websites: Service section and Projects section. The service section allows for inclusion of 3 basic services (for additions to this list, you’ll have to upgrade to PRO). The project section allows for adding 4 projects into the portfolio, each described by a short presentation and an image. For good promotion of the business within communities of people interested into their services/mission/values, the theme has options for links to social media profiles of the company. You can easily shape the brand personality, with the help of options regarding site identity (logo, title, tagline), colors and color schemes, settings for background image and settings for header customizations. 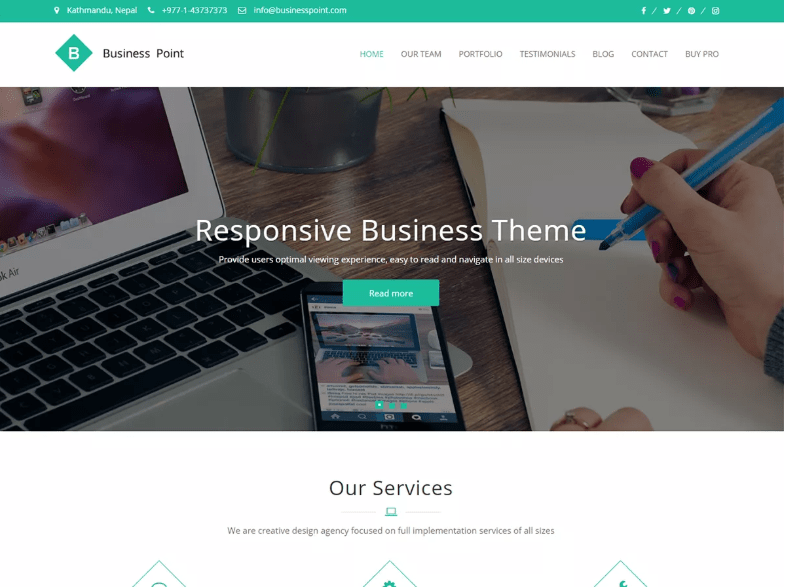 Business Point is another great theme dedicated to creating business websites. It has all major options that can make your website look professional. Also, it is a responsive theme, which means sites will be appropriately displayed on mobile devices. The theme has options for defining the site identity (which means logo upload, adding a title & tagline to the logo, choosing an image for the site icon), the background color for all website pages or else, the background image you’ll set for the website pages. The options specific to the theme are dedicated to customizing the header, the page layout and the footer of the website pages, while also adding (and adjusting the appearance of) breadcrumbs. Freesia Empire is a good choice for business websites, that want to keep current with the latest trends. It is compatible with popular plugins such as Contact Form 7, Polylang, WPML, WooCommerce. Thus, the theme is also adaptable to an online shop format. The theme has some specific options, such as: display/disable search form on website, display/disable page featured image, display/disable social icons, enable/disable sticky menu, enable/disable go to top, etc. 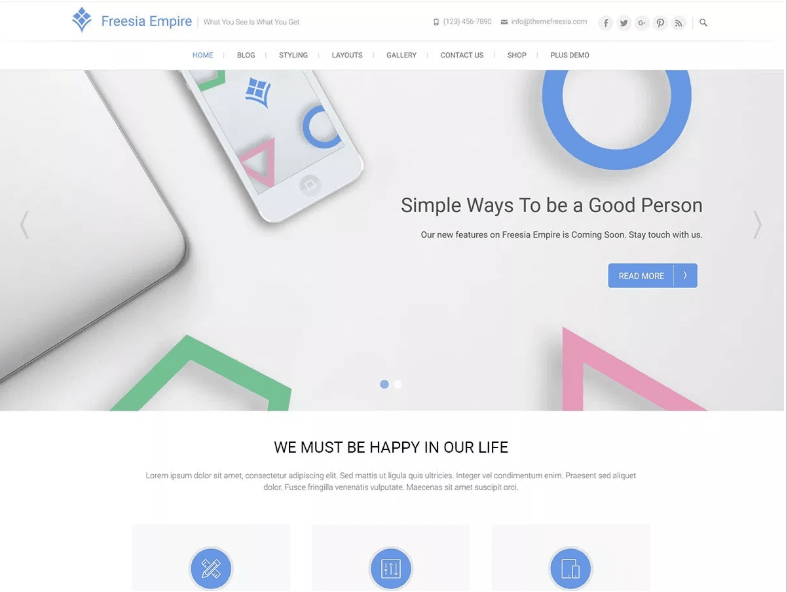 A powerful feature used by professional-looking websites, the integration of a page slider is possible with Freesia Empire. The slider settings can be applied only to homepage or to entire website. The widgets settings contain an interesting feature: you have the possibility to display contact info at Header. 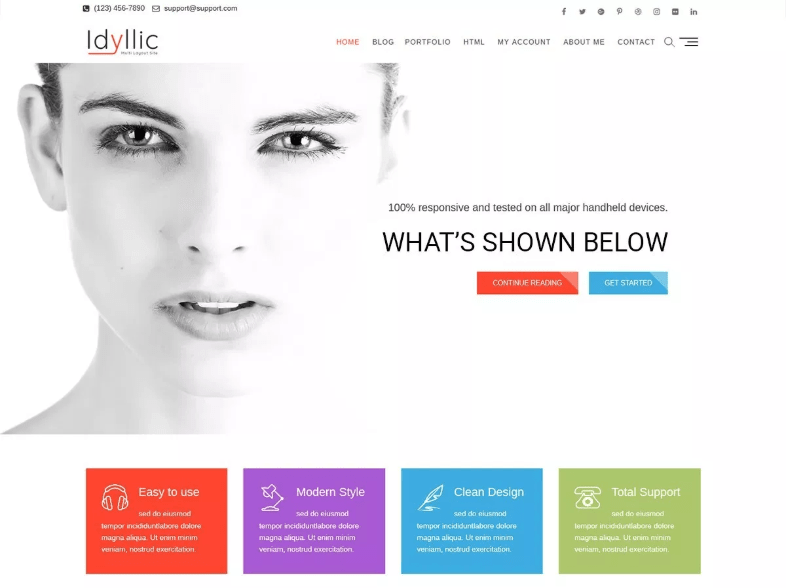 Idyllic is a perfect theme for business websites. It allows for creation of a professional-looking website in no time, just with the help of the options available in the theme Customizer. For the front-page, you have the option to insert sections such as: About us, Portfolio, Testimonials, Team Members (+ latest from blog). These sections are part of the key content blocks we’ve already described as specific to business websites. The specific theme options refer to customizations for the layout (site, blog) and inclusion of useful elements that might increase the website efficiency (search form, side menu or bottom social icons, sticky menu for ease of navigation, etc.). BeOnePage is special in that it is crafted for one-page business websites. Hence, it works well for creative businesses that are able to make that page stand out from other competitors with traditional websites. It is packed with multiple options for the front-page: each module has its own set of customization options (modules refer to slider, portfolio, blog, contact, etc.). Some modules can receive their own titles and subtitles, representative for the information that is developed in those sections. General settings concern enabling a menu to be set to sticky, enabling a go to top button for ease of navigation within the website page, creating a site title and tagline that best describe the business. 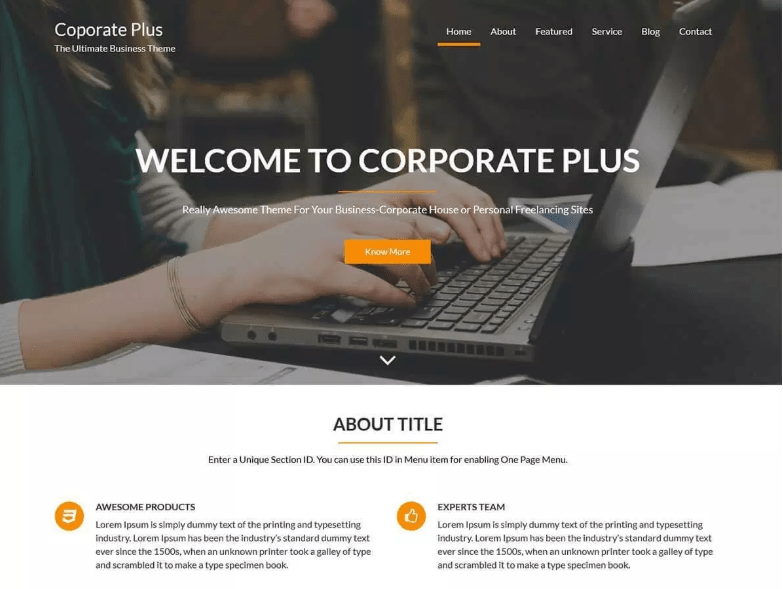 Corporate Plus is a multipurpose theme. It works well for building business websites and make them look professional, function efficiently, convince quickly. Many options regarding the layout allow for a clear organization of the website content and create a clean presentation; thus, the message of the company will be easy to grasp and communication with the website users will be a success.